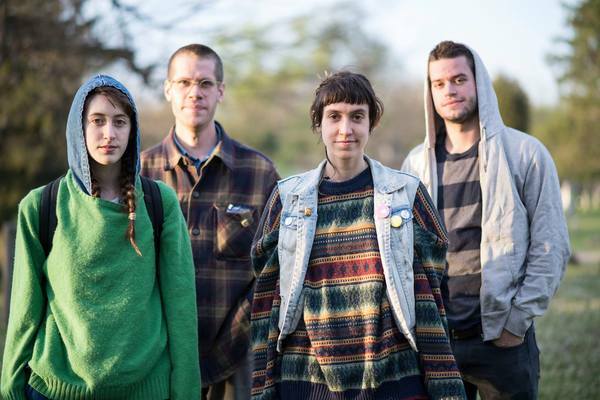 "Frankie Cosmos is a 4-piece band consisting of Greta Kline (vocals, guitar), Aaron Maine (drums), David Maine (bass), and Gabrielle Smith (keyboard, vocals). Their performances vary from slow sad ballads to goofy rock’n'roll love songs. They are based out of New York City (where Greta and Gabby grew up) and Pleasantville (where the Maine brothers grew up). The four members are each influenced by a wide variety of music, and all come from distinct music backgrounds." "Girlpool is a Los Angeles based two piece made up of Cleo Tucker and Harmony Tividad. Having met at local DIY venue the Smell, the two quickly grew very close. Their sound is comprised only of a guitar, bass and vocal harmonies. The band uses this bare bones instrumentation to accentuate their vulnerable yet powerful lyrics to create honest pieces, tackling concepts ranging from awareness and respect to the simple feeling of being alone at a show."